Colus esychus, copyright Jacksonville Shell Club. 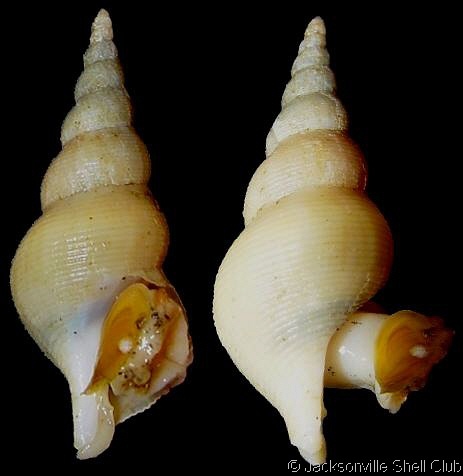 The subgenus Aulacofusus of the genus Colus is a group of whelks found in cold waters of the Northern Hemisphere. Characters (from Kosyan & Kantor 2013): Shell elongated-fusiform, medium-sized, sculptured by wide spiral cords (from 6 to 16 on the penultimate whorl); axial sculpture represented only by incremental growth lines. Last whorl about two-thirds of shell length, with well-defined, moderately long, straight or slightly curved to left siphonal canal. Aperture not high, less than half of shell length; operculum oval with terminal nucleus. Central tooth of radula consisting of wide rectangular plate with normally three short thick sharp cusps, of which intermediate one the longest. Lateral teeth bearing three cusps with the shortest intermediate one; teeth rows not overlapping. Proboscis very long (length sometimes more than shell height), several times coiled within thin-walled rhynchodaeum; buccal mass is 4-5 times shorter than proboscis length. Salivary glands large, not fusing beneath rhynchodaeum; salivary ducts thick-walled, with additional external layer of longitudinal muscle fibres. Stomach large as compared to proboscis, narrow, with extremely long posterior mixing area, comprising half of stomach length. Kosyan, A. R., & Y. I. Kantor. 2013. Revision of the genus Aulacofusus Dall, 1918 (Gastropoda: Buccinidae). Ruthenica 23 (1): 1–33.